SCHEDEL - [Sexta Etas Mundi. Fo CCXXVIII]. SCHEDEL, H. - [Sexta Etas Mundi. Fo CCXXVIII]. [Sexta Etas Mundi. Fo CCXXVIII]. - SCHEDEL, H.
Title : [Sexta Etas Mundi. Fo CCXXVIII]..
Map maker : SCHEDEL, H.. Date : Nuremberg, 12 July 1493. Size : 15.0 x 8.9 inches. / 38.0 x 22.5 cm. Description :On recto, several woodcuts of people and of an Ottoman Turk in the upper left corner. Two portraits of kings on verso. 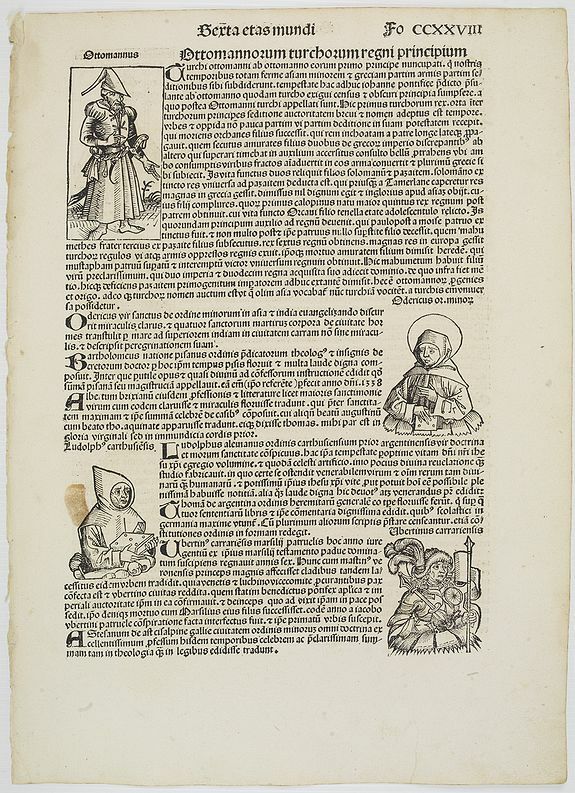 Page from the richest illustrated Incunable, the famous: Nuremberg Chronicle, published the year that Columbus returned to Europe after discovering America. In May of 1493 appeared in the Latin language one of the earliest voluminous books, fully illustrated with 1809 woodcuts printed from 645 woodblocks. The woodblock cutters were Michael Wolgemut, the well-known teacher of Albrecht Dürer, and his stepson Wilhelm Pleydenwurff. Wohlgemut was Albrecht Dürer's tutor between 1486-90 and recent scholarship has shown, Albrecht Dürer may also have collaborated, since some of the cuts bear a remarkably close resemblance to the Apocalypse illustrations. A opportunity to acquire a 15th-century book illustration by named artists.! Condition : Paper slightly age-toned. On smudge lower left on recto. Dark impression on large sheet. Else good condition.